I’m excited. This is the first time I have ever submitted anything to iTunes®, and it was approved in a day! I perhaps should have waited until I had more episodes in the can, but I never expected to be accepted on my first try, with my very first podcast. Look for the publicized launch when we have 3 or more episodes. So, this has advantages. I’m starting the podcast hosted on my server, rather than one of the specialty hosts such as Libsyn. I can always move it once we are wildly popular, but for now, iTunes is more important. 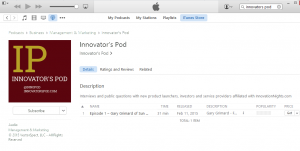 iTunes, Apple®, created podcasting and many times it will be nice to say “just search for Innovators Pod on iTunes”. I’ll add this to my ever-growing list of SEO and publishing skills.